Another Gameweek, another captain fail. Benteke was unable to complete a full match against Norwich. Insult was added to injury when Ings replaced him and subsequently nicked his goal and cost me a few hundred thousand in the overall table. 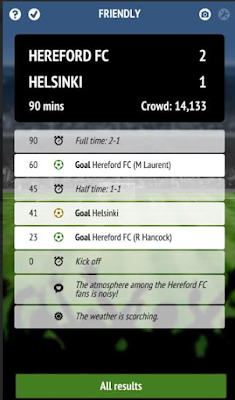 Hazard's dodgy goal (now classed as an own goal) didn't help my cause. On a more positive note, my -4 purchases of Mahrez and de Bruyne (high ownership & low ownership combo) worked like a treat as my team went up 300,000 net places. Progress is being made, slowly but surely. With my wildcard still available, I feel as if I can make transfers on a calculated whim and with creative license at hand. I made a shotgun transfer on Sunday night (as stated on Twitter) and immediatey bought Martial in place of Benteke. With a £0.3m increase and 675,000+ purchases later, I feel this was justified. I also gave the France International an honourable mention on the Weekly Fantasy Football Show. I bought him when he was a differential, but his ownership has already surpassed 20%. I wanted to offset this by buying a genuine differential, in the same vein as de Bruyne last week. I also wanted a Chelsea player - I believe they have turned a corner after their incident-laden win against Arsenal. Unfortunately, Chelsea don't have many low ownership players. Pedro/Hazard made sense against a dire Newcastle, but I'm giving Sanchez one final chance to bag a fantasy return before I sell him. This forced me to look at Chelsea's defensive cover. Zouma was viable, but I'm worried that he's competing a slot with Terry and Cahill - also I didn't want to sell Cedric for him. This led me to Begovic. I rarely take a -4 hit for a defender. But his next 3 fixtures are reasonable, owned by only 2% and I have saved £0.5m by selling Cech. 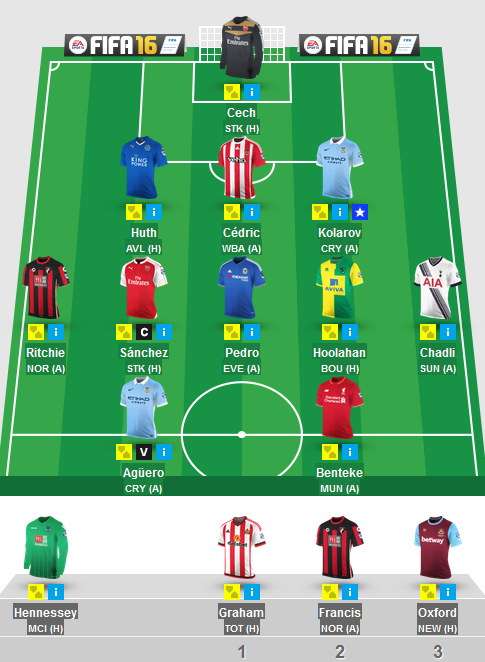 I have nothing to lose as I am "chasing" and I can tidy up any failed transfers with my wildcard. This week's captain was straight forward. It had to be the in-form Martial as he lines up against a woeful Sunderland team. He even scored during his League Cup cameo. Aguero's record against Spurs is of note, but his current form isn't correct for the armband. by going to The FBAs website. Or you can vote via Twitter by by clicking here and tweeting this. There we have it. 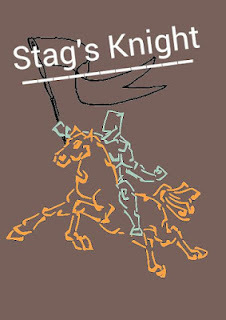 Another week over and another Stag's Knight is on the prowl! This weeks choice sees a return to Man City's midfield, this time to young Raheem Sterling. Since his record breaking £49 million transfer from Liverpool, Sterling has added much need pace, flair and penetration to City's attack. Many people expected his appearances to be limited but that clearly hasn't been the case. Pellegrini has been happy to keep backing Sterling so long he keeps scoring goals and creating chances. Raheem has been confident, making daring runs, and has reaped the rewards of having much more talented players around him than ever before. A quick look at Sterling's form this season will show you how much potential the kid has. He has two goals and two assists in six appearances. That includes a goal and an assist just this week in the Capital One Cup against Premier League strugglers Sunderland. I know that isn't a goal/assist per game but bear with me. 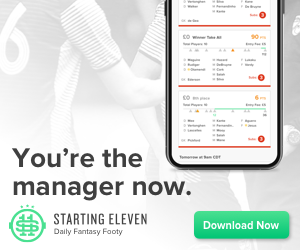 Sterling is currently owned by 12.1% of managers and his price has fallen to 8.9. The hype that surrounded Sterling at the beginning of the season meant he garnered a large ownership to start. Them bailing out to get players in scintillating form like Mahrez is the main reason why his price has fallen. Rightfully, some would have got rid of him because one goal and one assist doesn't justify allocating almost a tenth of your overall budget. I believe that's about to change now. He can build on his midweek success and his man of the match performance against Watford. In their next three games, City will take on Spurs in London before they host the hapless Newcastle and Bournemouth in Manchester. By investing in Sterling now, you are in place to reap the monetary rewards as his price rises if he produces like I expect him to over the next few gameweeks. Breaking down those fixtures a bit more, the Spurs game is obviously the most difficult one of the three. We all know Sterling could score here, but in truth it's a hard one to predict. Spurs' defence has been solid so far this season with odd lapses such as the Stoke game. Steve McClaren's Newcastle keep going from bad to worse. Their loss to Sheffield Wednesday during the week highlights how their confidence is at rock bottom. I'd expect a City goal bonanza in this one with Sterling sure to get in on the action. Bournemouth have struggled to keep clean sheets this season, Sterling again should have ample opportunity to add to his FPL points tally in that one. Sterling's stats aren't too bad either. They show he is willing to put crosses in and take shots every game. He has averaged 1.6 shots per game and 1.6 key passes per game in his 5 Premier League appearances so far. Of course we'd prefer if these numbers were higher, but last week's Stag's Knight Philippe Coutinho proved to us that taking lots of shots doesn't necessarily mean you'll score goals. By the way, 83% of Sterling's shots so far have been on target, so he won't suffer the same plague as his ex teammate! So there you have it, Stag's Knight for Gameweek 7 is Raheem Sterling. If you want to contact me on Twitter, you'll find me @FPLStag. Time to impose some Martial Law into your FPL team? Gameweek 7's episode is hosted by @FPLStag and also features yours truly, Chorley Rocks from Fantasy Football First and Kev from FanFeud. This week’s Stag’s Knight is Liverpool’s Philippe Coutinho. The Brazilian play-maker has been the only real bright spark in Liverpool’s offence this season, providing the creativity and guile to unlock opposition defences. Coming in at a pricey 8.1 and 14.8% ownership, he isn’t necessarily the biggest differential you’ll find, but that’s irrelevant if he gets you the points! Unfortunately for Coutinho, his incisive passes have gone to waste so far this season as Liverpool’s strike force continues to waste opportunities. That said, we all know Christian Benteke’s ability when he hits form. Maybe his spectacular goal against Man Utd last gameweek hints that he is beginning to find his shooting boots. The low point for Coutinho so far this season was undoubtedly his needless red card after picking up 2 yellows in the embarrassing 3-0 defeat at West Ham. This Sunday’s game against Norwich will be an opportunity for the ‘Little Magician’ to repent for his grave sin, missing the grudge match at Old Trafford, to the Anfield faithful. Coutinho’s highlight of the season so far came when he got the one and only goal as The Reds overcame Stoke City in Gameweek 1. He displayed that day the most vicious weapon in his arsenal. That is his ability to lash in vicious shots from long range. That day Coutinho grabbed a very ordinary game by the scruff of the neck, surged forward and perfectly mixed power and precision to beat Jack Butland from 30 yards out. That goal wasn’t a flash in the pan either. Coutinho likes to “have a go” at goal. This is emphasized by the fact that he has averaged 4.5 shots per game so far in the league this term. What else has Coutinho got going for him? For a start, Liverpool’s fixtures are very favourable. The next two weeks see them take on Norwich followed by Villa at home. Norwich’s defence hasn’t been unbelievable recently while Aston Villa continue to leak stupid goals. I also wouldn’t be surprised if Villa struggle brush themselves down and push on after their collapse against Leicester. Coutinho’s 3rd game as Stag’s Knight will be a cross-city trip to Goodison Park. The Merseyside derby has been known to be fiery and produce goals. I’d back Coutinho over any of the other Liverpool players to be the difference. Also, I saw Liverpool’s midweek Europa League match as a possible turning point. Against a superior Bordeaux side, a team consisting of 5 teenagers (Ibe, Rossiter, Gomez, Brannigan (sub) and Pedro Chirivella (sub)) managed to hold out for a draw. For much of the game Liverpool were pegged back and looked doomed. In the end, they could have won it with Danny Ings the man who missed the big chance. Lallana and Coutinho worked brilliantly together, with Coutinho assisting Lallana’s fine goal. Success in tough games like these breeds confidence in teams. I view Liverpool’s next few matches as their best opportunity before Christmas to get their season on track. Philippe Coutinho will play a crucial part in every move Liverpool make, surely picking up goals and assists along the way. Stag’s Knights didn’t have much to brag about last gameweek. Nacer Chadli and Matt Ritchie both finished with disappointing blanks as Spurs barely overcame Sunderland and Bournemouth fell to Norwich. David Silva missed out through injury but thankfully returns this weekend. You would have thought I won the Rugby World Cup when Wes "Wessi" Hoolahan bagged an assist and goal during the previous Saturday afternoon. His herculean efforts, along with a flurry of clean sheets catapulted my team up the rankings from 2.1 million to 1.2 million in the space of 2 hours. Alas, those heady heights weren't to last as Mahrez's two assists and Payet's two goals knocked me down a few hundred thousand places, but I bagged a green arrow nonetheless. Granted, the captain fail of Sanchez didn't help. 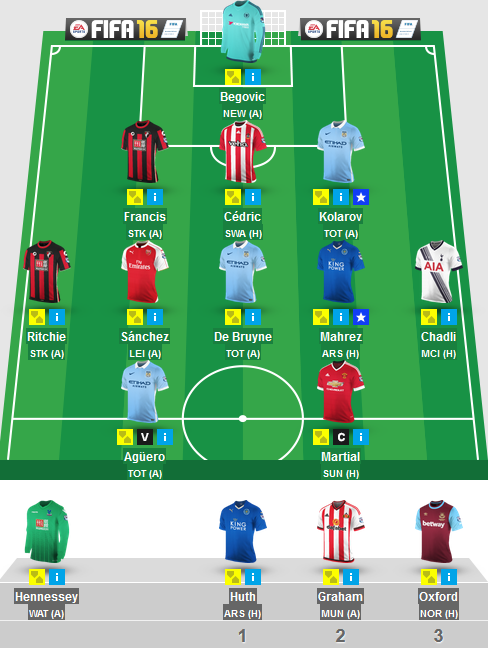 However, Kolarov's 9 clean points was a mega boost to my team. Looking to Gameweek 6 I decided to take another -4, albeit controversial, hit. I decided to sell Hoolahan, as I believe he will be unable to deliver consistent fantasy returns, in part due to harder upcoming games and as he often plays less than 90 minutes. His effectiveness in the long-term is questionable. I replaced him with Mahrez, as he is the most owned player and has scored the most points. He has scored double digit FPL points in every game except for one, which is impressive. I simply couldn't ignore him anymore. In truth, he was a counterweight for a differential signing - de Bruyne. I'm amazed that the Belgian is owned by less than 2%. I know he hasn't started a match for City as of yet, but I'm confident he will after his first impressive appearance where his BPS was higher than almost all of the attacking players. I decided to captain Benteke due to his recent form and also as a result of Liverpool's Suarez's fantastic goal scoring record v Norwich. Aguero is also a good shout, but I'm not keen on giving him the armband due to his recent injury. Chadli as captain was also an obscure option, as was the in-form Mahrez. Other than that, if you can vote for us (see below) that would be greatly appreciated. Have a good Gameweek 6! It was through your support that this blog was confirmed as a finalist at the 2013 and 2014 Football Blogging Awards for "Best FPL Blog". The aforementioned slot isn't present for 2015. With this in mind we have entered the "Best Influencer" category. We believe that this is befitting to the service that the blog and Twitter account provides - a basic combination of wanting others to do well with some sensible planning. Thanks to @fplhints. Picking players from the top and bottom 6 teams was one example of many sound pieces of advice he gave this season. The influence of ALL of our writers, past and present, has played an important part in this blog receiving peer acclaim. We aim to help others by providing fantasy football advice - be it FPL, PlayTogga or FanFeud. In addition, the plethora of words we use on the blog and on Twitter have gained wider currency in the ever growing FPL community - such as Differentials, Mini-Wildcard, Pound Shop Defender, Baps, Power 7, etc. Our influence hasn't been restricted to funky jargon and general advice. Ultimately, our specific transfer purchases have been integral to the blog's success, whether it was Martin Petrov during the famous Double Gameweek in 2012 or Dame N'Doye's in 2015. We always publish the blog's FPL team in advance of every Gameweek so that FPL managers can gain insight and benefit accordingly. A large part of our influence and growth (in terms of hits and social media following) comes down to the blog team's FPL success - Top 1.1% finishes for the last 4 seasons is no mean feat - very few FPL managers have been able to achieve this, which is partly why we are consulted on a weekly basis. You can vote for FPLHints as the "Best Football Influencer" by going to The FBAs website. So here we are. Over 10% of the season is complete and normal service still hasn't quite resumed. Man U and Chelsea continue to stutter and Arsenal have just enough to overcome 10 man Newcastle. The vacuum at the top of the table has brought Palace right up to the top. 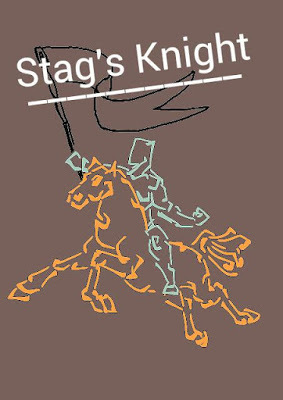 Had they not been playing a high-flying and seemingly impenetrable City team this weekend, you would certainly have seen one of their players donning Stag's Knight's armour. But alas, we must look beyond the London outfit to pastures new. Bournemouth's fixtures make investing in their attackers very tempting. It goes without saying that Callum Wilson has had a staggering start to the season, finding himself as the league's joint top scorer along with Mahrez and Gomis. Granted 3 of those goals came in the 7 goal thriller versus West Ham, but the stat cannot be scoffed at. His ownership has surpassed the 20% limits that Stag's Knight encompasses so I've been forced to look to the Cherries' midfield. However, the shape of that midfield will be changing drastically from what we saw in the opening 4 games. Eddie Howe's men have been dealt a hammer blow with the news that winger and assist supplier Max Gradel will be sidelined for 6 months after he was injured in the draw with Leicester. Cue the music. Bournemouth need a new hero. A hero of yesteryear who has a point to prove. A player who will be desperate to display his massive ability following a disappointing to the season. That man is last season's maestro Matt Ritchie. The English born Scotsman will want to show that last season's 15 goals and 17 assists in the Championship weren't a mere fluke. He's shown his class previously so Howe will be forced to deploy him further forward from now on to get offensive returns. I genuinely can't see a better option for Howe. Putting on another striker would be too risky for a team whose defence hasn't been solid. Bournemouth's next three gameweeks see them travel to Norwich, host Sunderland and then go away to La Masia reject retirement home Stoke (Don't lose your mittens, that's a joke friends). These are all games where Bournemouth would be hoping to pick up points. They can't keep clean sheets so scoring is their only option. Now, I'd love to say that I have fantastic stats to back up my case for Ritchie like I usually do. I do have the stats, they're just not fantastic ones unfortunately; Ritchie has been taking 2.3 shots per game and supplying just 1 key pass per game. However this isn't too different to his more successful and mortally injured teammate Gradel who has 1.5 shots per game and 1.3 key passes. If anything, that stat highlights Gradel's luck in comparison to Ritchie so far. Lets not fret though. I've put my neck out on the line again to try and give you guys what I'm now terming "an educated yet not too different differential." Last time I did it with Jeremain Lens, the returns were respectable. So there you have, your Stag's Knight for Gameweek 5 is AFC Bournemouth's attacking midfielder Matt Ritchie. Follow me over @FPLStag if you want to pester me for FPL advice or have random questions about the meaning of life. Judging by my overall rank so far this season, I'm more of an expert in the latter!!! The acquisitions of the former Barca men has effectively treated me to a differential tri-attack. This will ensure that my team isn't too template-esque, but at the same time isn't overloaded with low-ownership one hit wonders. My final transfer led me to taking a -4, but I did so without any qualms. Kolarov's regular starts for City, sub £6.0M price and awesome form is a dream for any FPL manager. To top things off he has a good run of upcoming games until GW 12 at the very least. Looking back, I could have very easily baulked at my 2,000,000+ rank and activated my actual wildcard. But I'm sticking to my plan. After GW8, once the late transfers such as Martial, de Bruyne, Dijk and the like have settled in, I will happily activate it then. In the meantime, let's hope things turn around, pronto. 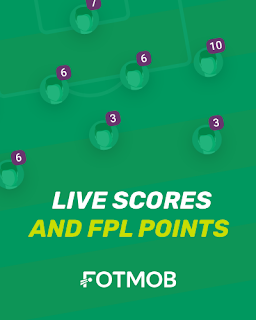 As you may have noticed, we’ve been full of praise recently for the Football Chairman app (www.football-chairman.com), which we’ve been playing ever since the first version launched in 2013. A few people have asked us whether it’s worth playing, so we thought we’d give you our top five reasons why the answer is YES! The “Lite” version of the game is completely free to download from the app stores and doesn’t have any time-limits, paywalls or annoying adverts. There are in-app purchases, but they’re completely optional and we managed to build a successful club (and have hours of fun in the process) without spending a single penny of real money. So many football management games these days require a massive amount of time to play them properly. Luckily Football Chairman bucks that trend by being really quick and easy to play. 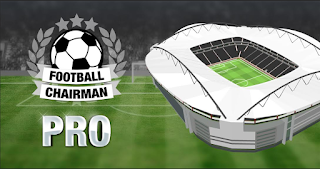 By taking on the role of chairman, you avoid some of the more tedious tasks that the managers perform – for instance setting up training regimes or endlessly shuffling your squad around. As a result the seasons fly past and it’s the perfect game for the morning commute, or for those 15 minutes at half time in a televised match. Because the seasons go so quickly, it’s very hard to put the game down. If you’ve had a good season and gained promotion, you’ll be eager to move on and see if you can continue your success in a higher division. Or if you’ve had a season to forget and your club is on the slide, you won’t want to close the app down until you’ve put things right and got your club heading upwards again. 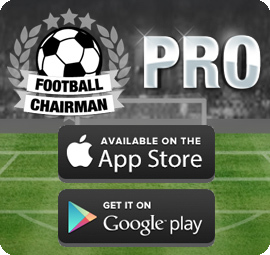 The latest version of the game – Football Chairman Pro – adds a whole new level of realism to the challenge of being a chairman. Whether you’re wheeling and dealing in the transfer market, unveiling the latest gleaming addition to your 3D stadium, or dealing with the manager’s request for a team-bonding break, the new game adds an extra layer of depth. But what’s impressive that the new features haven’t taken away from the speed of the gameplay. The Pro game only launched a few months ago and already the developers are adding new features to the app as free updates. For instance, in the next month they are planning to launch a data editor that will allow users to create their own game universes. And if you don’t fancy the hassle of creating your own data, you’ll also be able to load other people’s datapacks, meaning a whole new world of foreign leagues to play. Like what you see? Go on, give it a go! 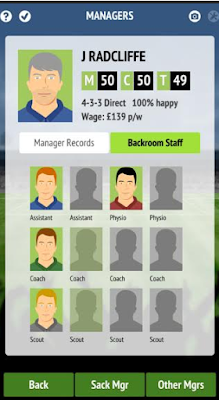 Football Chairman is available for iOS, Android and Kindle devices. 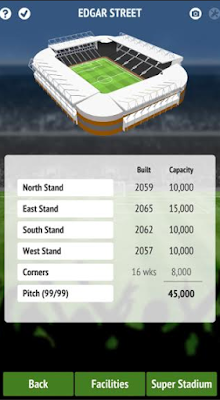 For more details visit www.football-chairman.com or search the app stores for “Football Chairman”.